The 34-year-old singer stunned fans with her incredible rendition of the single as she took to the stage with Coldplay during their set at the big football game in Santa Clara, California. Following her performance, Beyonce made headlines when she unexpectedly announced she will be hitting the road for a new world tour this summer. In an interview after the event, the mother-of-one said she was blown away by the response to the track and was thrilled to be able to perform in front of such a huge, enthusiastic crowd. "It makes me proud," Beyonce told Entertainment Tonight of the experience. Formation dropped over the weekend, coming as a shock to many of Beyonce's fans. However, she said for her the track is more than just another a single and has a meaningful message behind it. "I wanted people to feel proud, and have love for themselves," she added. 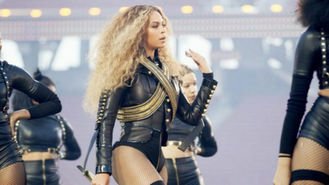 Beyonce also used the Super Bowl to dispel the rumours she might be expecting her second child with husband Jay Z, wearing a skintight leather leotard for the event to showcase her slim frame with no hint of a baby bump. Her four-year-old daughter Blue Ivy was in the audience to watch her mother's incredible performance. Beyonce's friend Gwyneth Paltrow had earlier shared a cute picture of her own daughter Apple, 11, holding hands with Blue as they strolled up to the gates to head into the game. After Beyonce's performance with Coldplay and other special guest Bruno Mars, a commercial promoting the unannounced The Formation World Tour aired, much to the delight of fans who crashed her website immediately after the ad ended. The 40-date tour will mark her first solo headlining tour since her 2013 Mrs. Carter World Tour trek. Beyonce is expected to kick off the North American leg on 27 April (16) in Miami, Florida, and continue in the U.K. and Europe from June through July (16).